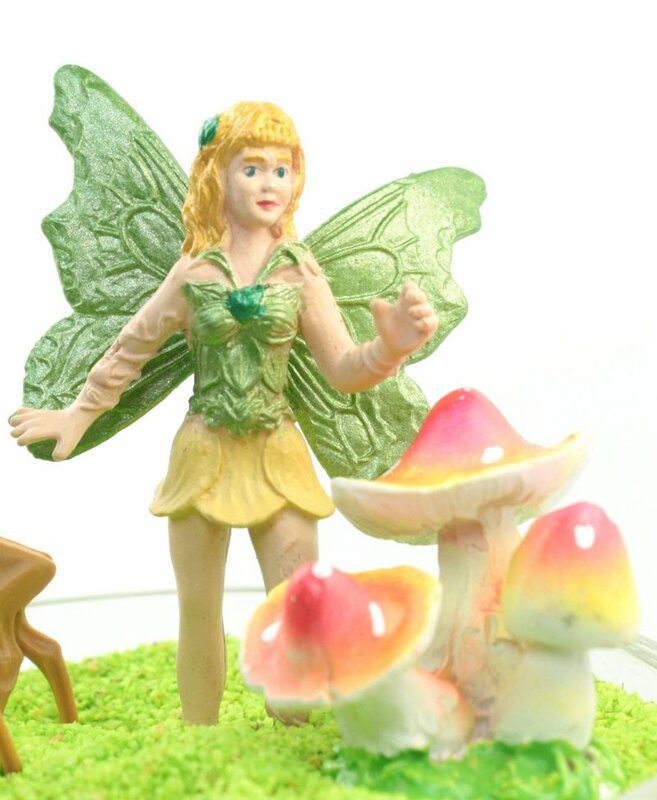 A local paper ran a big story on Fairy Gardens, how fun there were to create, how kids just love them and how magical they can be. By dumb luck, we are finding ourselves smack dap in the middle of the explosion of fairy gardens and terrariums for one simple reason. We just love miniatures. We love gnomes, fairies and all miniature things. So, when we see them, we stock them, by the thousands. Now, I have never made a fairy garden or a terrarium myself, but I have surrounded myself with the most creative marketing people I know, who actually DO build fairy gardens. I mentioned it was going to be Fairy Garden Friday and I need a little “something, something” for my blog post, and this arrived on my desk. They called it a Terrarium in a Bowl. So simple, even I could make it! Green Fairyland Gravel, some deer, a mushroom and a little fairy. The week of something mini. Detailed German Minis that is! While we are known for our Glitter, there are other areas of the business that are just as important to us and our customers. Every month, we sell thousands of tiny little miniatures and operate a separate miniature shoppe on our website, plus ebay and Etsy stores, primary to present our miniature line. To celebrate us having on of the largest supplies of vintage German miniature, we are going to be talking miniatures all week! In today's post are going to give you just a few examples of some of the great things you can do with our miniatures! 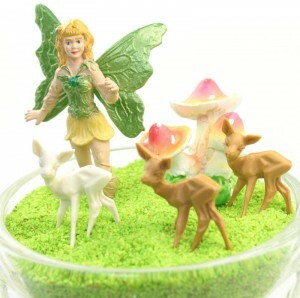 Example #1 (above) Little deer, rabbits and mushrooms being used in a Terrarium Kit from ACME Party Box. Example #2 Hand made miniature trees from Germany, as used by Laughter and Lemondrops. And example #3, some of our flatback miniatures used on hand produced cards and scrapbooks. Check in back this week as we are going to be presenting much more on our miniatures, both projects ideas, but also some of great new items that we going into the store this month! So, sit back, relax and get ready for a wild week of little tiny miniature things! We are going to start talking about Snow Globes. Just Warning Ya. This is a warning to all my readers. With 2010 coming to an end, I am going to start to do something different. I am going to start talking a bit about Snow Globes. There is a reason for this, a deep historical element of our DNA comes from vintage 1950's Snow Globes. Just like part of your family history that nobody talks about, we are a Snow Globe power house. But nobody knows this. Case in point, we are sitting on the largest known inventory of 1960 vintage Snow Globe Figures in the known world. I am not overstating this. It is a fact. Prove me wrong, and I'll give you a crisp $10* bill*. Cash American*. This how excited we are about this stockpile we have, a stock pile that really no one knows about. *Important Offer Disclaimer: $10 reward is not really a cash reward, but rather will be provided as $10 worth of Snow Globe Miniatures pieces and parts. Winner of the $10 must pay all local, federal and state taxes and a shipping and handling fee of $24.95 and must agree to never mention this offer again to any living or decreased person, for the rest of their natural life, including, any additional lives you may have after leaving the physical being as we know. Not to be combined with any other offer or discount and is only valid until 1/1/2011 at 12 midnight.